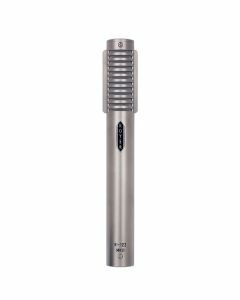 The R-122 is the world's first phantom powered, active ribbon™ microphone. Its unique electronics package gives the R-122 greater output than standard, non-powered ribbons, and places a perfect impedance load on the ribbon element, greatly expanding the number of preamps the mic operates well with. Before the R-122, all ribbon microphones were passive devices. Tracking strings, acoustic guitars, vocals and other quieter sound sources required pre's with a lot of gain and a high input impedance. With the R-122, gain and impedance issues are a thing of the past, letting you use more pre's with great results. -15 dB pad before the mic’s electronics gives more headroom when activated.